Junior transfer student and Electrical Engineering major Samantha Bell has a pretty impressive summer job. Last year she worked in a physics lab doing ultrasonic testing for the Orion program. She was originally working with Ground Systems Development and Operations Logistics, but she is now assigned to the pathway program's Electrical Circuits Lab. And if that all sounds like rocket science to you there's a pretty good reason...it actually is rocket science. She's an engineering intern at NASA. Bell is a graduate of Foreman, AR High School and was previously studying mechanical engineering at a university in another state. "But they didn't offer an electrical engineering degree, and that's what I really wanted to study," said Bell. "Then I heard about the new electrical engineering program at A&M-Texarkana, and it just made sense for me to be here." 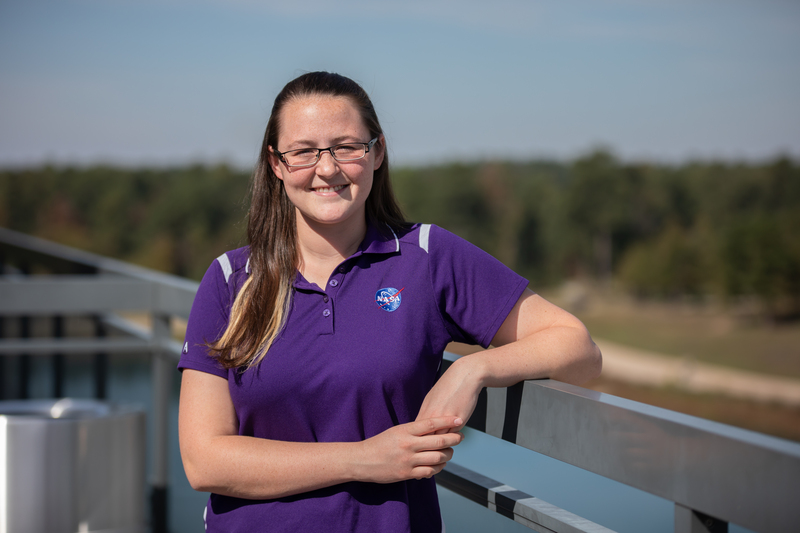 She plans to return to Florida's Kennedy Space Center this summer to continue her internship, where she will be designing circuit boards and instruments for future rovers and landers. After graduation she would like to pursue a PhD in Physics and do research work at the Johnson Space Center in Houston.